I recently bought an absolute peach of a locomotive, a new Dapol class 22. It runs so well and is ultra smooth even at speed step 1 on my NCE Powercab under DCC. Total cost £28. Well pleased with that. The class 22s were all gone I think by about 1972. I've no idea if the wagons its pulling would have been right era-wise but it looks good IMO. Some savvy shopping there Alec, resulting in a nice little train. Will we be seeing you at Tonbridge on Saturday? Aaaaaaargggghhhh!!!! Is it THIS Saturday Graham? Bugger! Can't make it - family wedding this weekend. Is it really two years already since you took all my money for the sound equipped Dapol 121? It still runs like a dream, looks and sounds superb. Hope you have a great show. Missing the show because of a wedding? There's no dedication these days. Glad the 121 is still going strong. See you at N Gauge Southeast perhaps? 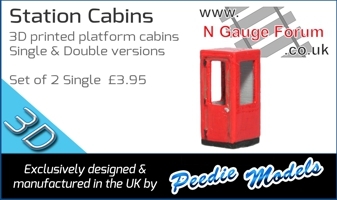 See you at N Gauge Southeast perhaps? Yep, planning on going to that one. My new Southern Region layout will be there. That is certainly a great twenty eight quid's worth!